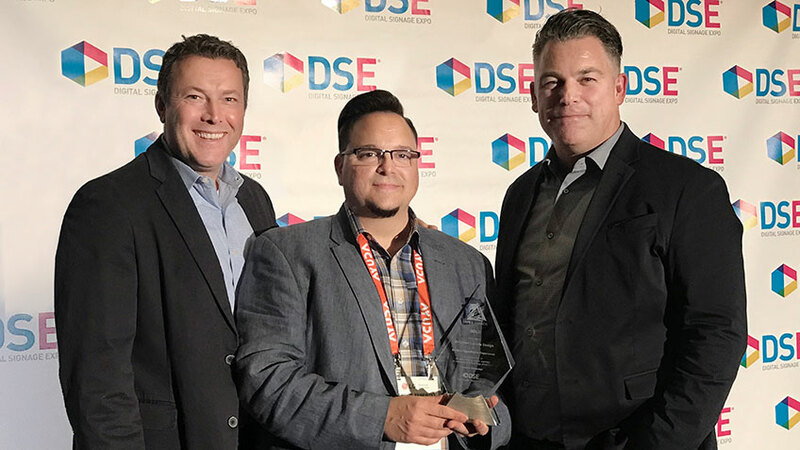 Shikatani Lacroix has won a Gold APEX Award at the Digital Signage Expo (DSE) for designing an immersive restaurant bar experience for Boston Pizza. Shikatani Lacroix received a Gold APEX award in the Food & Beverage category, selected by an independent panel of 10 industry experts and journalists. The award was presented at the DSE 2018 APEX awards gala on Wednesday, March 28 in Las Vegas, Nevada. This award celebrates innovative digital displays, interactive technology and compelling viewer content for B2C and B2B companies. This flagship location at Front and John streets in Toronto’s downtown core, is located near the city’s two major sports stadiums: Rogers Centre and the Air Canada Centre. Boston Pizza looked to create an immersive experience, marrying digital and physical to capture Millennials’ attention and position Boston Pizza as the ultimate provider of sports content and information. The digital screens are a one-stop shop for their consumers’ sports needs while dining providing dynamic, RSS-driven, digital messaging with team statistics, player statistics, news, game schedules, team match ups, player match ups, and valuable information for fantasy leagues for all major sports: NBA, NHL, MLS, MLB, NFL. DSE is the world’s largest conference and trade show dedicated to innovative digital communication and technology solutions. The APEX Awards celebrate innovative work in this field in nine different categories. This year’s winners were selected from 116 entrants in 10 countries.